Sols 2020-21, April 12, 2018, update by MSL scientist Ken Herkenhoff: The top science priority for this plan is to acquire all of the data needed to adequately characterize the rocks at the current location before driving away. So the GEO Science Theme Group discussed the priorities of various proposed observations, including a Right Mastcam mosaic of the arm workspace and surrounding area, ChemCam LIBS targets, and a mosaic of the mid-field terrain toward the south. Fortunately, power modeling indicated that the pre-drive science block could be lengthened to 2 hours, which made it much easier to fit all of the desired observations into the plan. 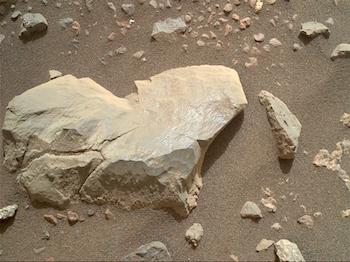 This entry was posted in Reports and tagged Aeolis Mons, Askival 3, Bressay, Curiosity, Gale Crater, Jedburgh, Ledmore 2, Lorne Plateau, Mars Science Laboratory, Minginish, Mount Sharp, MSL, Murray Formation, NASA, Tyndrum 3, Vera Rubin Ridge, Waternish. Bookmark the permalink.